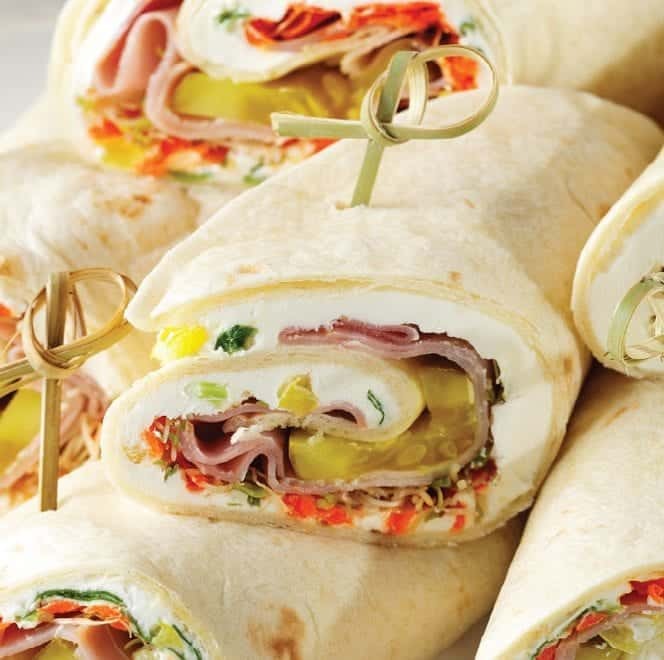 Sandwiches, wraps, and roll-ups are a great way to pack healthy meals when you are one the run with family. Their portability and versatility make them excellent meal choices for family picnics, backyard parties, baseball games, or just on the go. The more satisfying and fun to eat, the more crowd-pleasing. A beloved tried, and right combination is ham and cheese. Although, definitely a winning combo, it can start to taste dull after a while. This recipe, for Mt. Olive Pickled Tortilla Roll Ups, takes delicious to a new level. The secret? Adding Mt. Olive Mild Banana Pepper Rings and our Kosher Dill Sandwich Stuffers. These warm roll-ups will score big with your friends and family and have them begging you for the recipe. True to form, this roll-up is a cinch to make and easy to dress up or down. Assembly of one roll up takes about the same time as making a sandwich, five minutes. To transform these into appetizers, just cut them into smaller pieces. When making any recipe in bulk, it’s always easier if you have the ingredients already pre-cut and readily available. Have the sliced green onions and grated carrots ready to go in your fridge to shave a few minutes off your prep time. After all, who wants to be cutting onions five minutes before your party guests or hungry kids and their after school buddies arrive? Carrots and onions might not be your favorites. Consider replacing them with other veggies of choice, asparagus or crisp romaine lettuce, to name a few. If you are looking for a little more kick in the recipe, consider subbing or adding Mt. Olive’s Buffalo Kosher Baby Dills with Texas Pete hot sauce. The spice is right without compromising the crunch that Mt. Olive Pickles bring to this recipe. Tortillas are ideal bases for roll-ups, on account of their flexibility. However, if you want to introduce more color into the recipe, consider using veggie tortillas in place of the plain flour tortilla. Using sun-dried tomato or spinach-flavored tortillas, give these roll-ups a festive look kids will adore. The best part about this recipe is it can be as versatile as you’d like it to be. It requires no cooking, which leaves room for more time in the creativity department. For those of us that like playing with recipes or making meals as a family, this recipe is perfect. The kids can have fun rolling them up, while you cut and skewer them with fun decorative toothpicks. Lay them on colorful floral platters or a long white display dish, for your next get together. Pack the full sized version alongside carrot sticks and nut mix, for your next hike. Keep a couple cut up, in the refrigerator, for easy snacking. Our Mt. Olive Pickles remain crisp and allow these roll-ups to keep their structure. No mushy, messy meal here. The ingredients in this recipe are familiar, you might already have them at home, but they are also easy on the wallet. So, don’t feel guilty about making them over and over again, till you perfect them. After all, with spring around the corner, summer is only a few months away, and these are sure to make excellent beach companions. Pull out your apron and best chef hat; this is a recipe you won’t want to pass up. Cut onions and pickled pepper rings into small pieces and stir into cream cheese. Spread equal amounts of mixture onto each tortilla. Sprinkle surface with grated carrots and sprouts. Top each with 2 slices of ham and one Mt. Olive Kosher Dill Sandwich Stuffer. Roll tortillas from one side, keeping roll tight without pressing out filling. Serve immediately, or promptly wrap each roll tightly in plastic wrap and refrigerate.